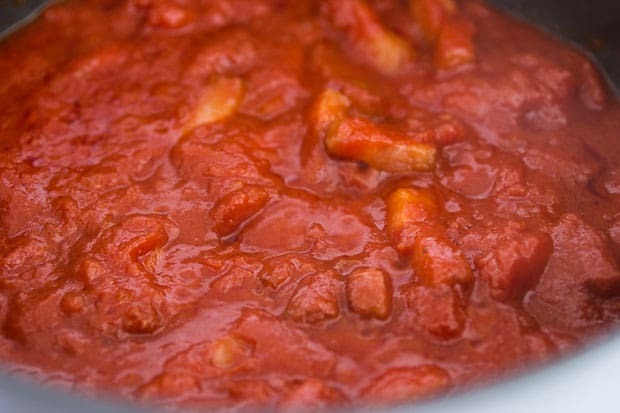 Easy delicious recipe for Sugo all'Amatriciana, a simple sauce from Amatrice made with guanciale, tomatoes and pecorino cheese. 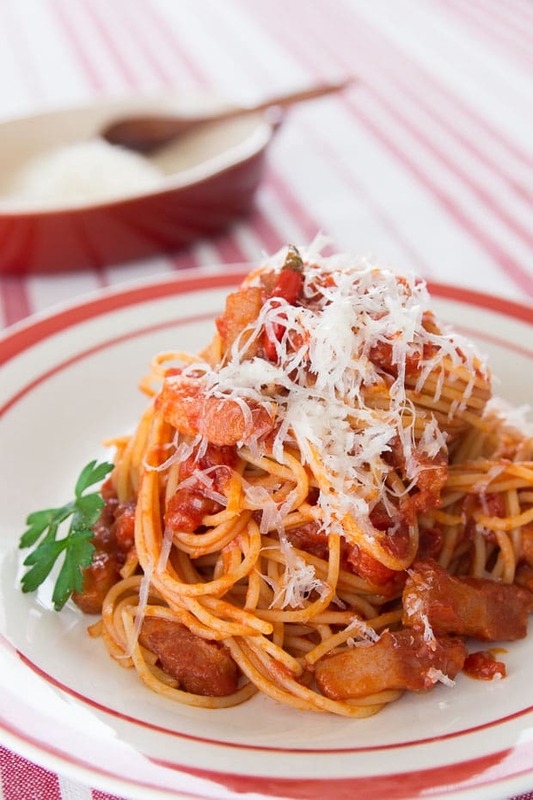 Bucatini All’Amatriciana, like most authentic Italian pastas is a simple dish from Amatrice, where tomatoes are fried in the rendered fat from guanciale and tossed together with some cheese and Bucatini. But for me, cooking is about more than just following a rigid set of rules. It’s about working with what you have and making a dish that suits your palate. For my Spaghetti Amatriciana, I’ve embellished a bit and added shallots for extra flavor and wine for…. Well… do I really need a reason to add wine? I also didn’t have any Bucatini on hand, so I went with Spaghetti. It’s still a wonderfully simple pasta that doesn’t take all day to make, and yet the flavors are simply irresistible. By irresistible, I mean it will having you casting other meat sauces aside like a worn out shoe. So what makes Sugo all’Amatriciana so seductive? Put simply, it’s the Guanciale. If Pancetta is the Italian cousin of bacon, Guanciale is like Pancetta’s redneck half-brother conceived during a moment of passion in a cellar perched atop a hill in Lazio. Sure, it’s not as pretty looking as a roll of neatly layered Pancetta, but what it lacks in polish, it more than compensates for with its wild marbling, intense meaty flavor, and dare-I-say hint of barnyard funk. Unfortunately (or fortunately), it’s difficult to find in the US, so any cardiologists reading this can relax. That’s also probably why it’s managed to fly under food safety groups’ radar for now. 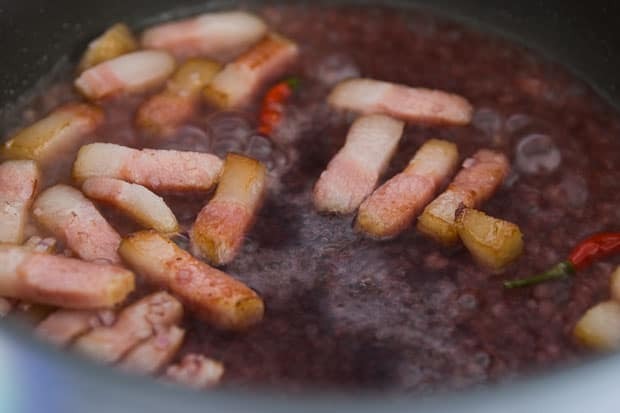 Pancetta or unsmoked bacon could be used in a pinch, but it would be like The Beatles without Lennon or Apple sans Jobs. Still delicious, but not quite the same. 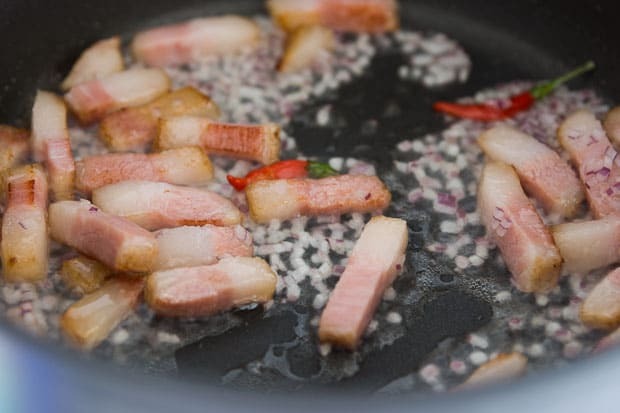 Add the Guanciale to a frying pan in a single layer and put the pan over medium high heat and let it brown on one side until some fat has rendered out. Add the chili pepper and shallots and stir-fry until the shallots are cooked and fragrant. Be careful not to overcook the guanciale or all the fat will render out making it tough. Add the wine and let it boil until most of the alcohol has burned off. Add the pasta to the boiling water. Boil the pasta for 1 minute less than what the directions say. Add the stewed tomatoes, tomato paste and salt. Use a spatula to crush the tomatoes and simmer over medium low heat until the pasta is done. Drain the pasta reserving some of the boiling water water (the tomato can is a good place to put it). Add 3/4 of the Pecorino Romano to the sauce and stir to incorporate. Add the pasta and toss to coat evenly, add some of the reserved pasta water if the noodles start sticking together. Plate the pasta and serve with the remaining cheese for sprinkling. Wonderful pictures (as always!) and amazing recipe. My most sincere props to you, from bottom of my Italian cholesterol-coated heart! Such a wonderful sauce to go with the pasta! Love it! Yum, I love pasta amatriciana as I have a weakness for anything hot and spicy. Also, I’ve been wanting to get my hands on guanciale for awhile and your post only re-confirms that this is Something I Must Do. I’ve been wanting to try a Pasta Amatriciana for a while now, and I even know where to get guanciale here in Portland. This looks amazing! Thanks for the recipe. Oh heavenly Guanciale! I had my first taste of it a few years ago, I made a pasta dish with gunaciale and truffle oil, imagine the two married together and tossed in pasta! Darn you for making me crave it again! Marc Marc Marc. You should know that I was once seduced by a wily French chef who prepared Amatriciana to beguile me. You can’t issue enough warnings about this one. This post was hysterical! I’ve had Amatriciana and have loved it. I wonder where I could obtain some guanciale.. Boy and I love anything that leads to obesity (as long as we’ve already gone to the gym)! One of my all-time favorite pasta dishes. I’ve been bummed not to be able to find pork cheeks so I can make my guanciale. It’s just so much better for this and carbonara. I like your additions, too. I’ve never added wine to mine–I think I’ll try for next time. I want this, like, tonight for dinner. And I’ll take pork in any of its preserved forms, happily, in excess. Pizzeria Mozza has guanciale on one of their pizzas, and it’s to die for. That was the first and only place it’s been seen so for. For that reason alone, this is awesome. I LITERALLY want nothing more than a huge bowl of this RIGHT. NOW. That looks DELICIOUS! Yum. Now I’m hungry.. Your photography is top notched and the recipe plus pictures look totally scrumptious…! I’ll definitely give it a try! 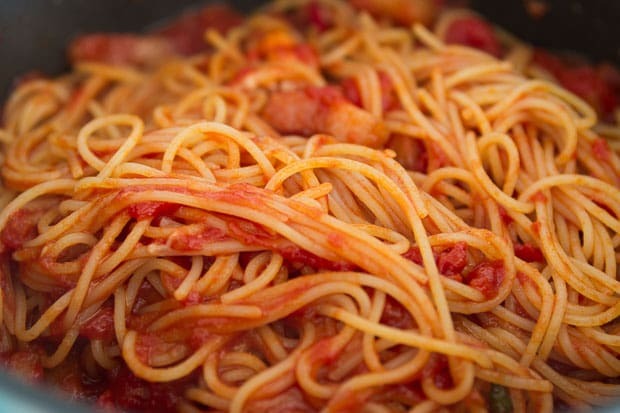 I, for one, cannot pass up a big bowl of spaghetti with a lusty sauce like this. Fabulous recipe! This must be my husband’s favorite pasta dish so now I can make it for him. Beautiful. And your words are marvelous, have me rolling on the floor. Funny guy! I made this as well a few weeks back and posted it from Mario’s Molto Italiano book. Very easy and delicious, however, could not find guanciale here in the Garden State and a trip into the city that day was not feasible! Bacon was just fine. I need to hire you as my food photographer! As always, gorgeous photos. Hey it sounds really good, if I can just find some of that stuff that’s like drugs. how much does this feeed ? If you live in Seattle, guacinale is easy to get at Pike Place Market, at DeLaurenti. Never heard of it before, it was sooooooooooo good. A California Zinfandel would go great with this dish, or if you want to stick with Italian wines, I’d pair it with a Sangiovese. I found it in Whole Food, Woodland Hills, CA. I made it the classic way. I used canned San Marzanos, some sauted onion in the sauce, and pecorino. Guanciale should get the Oscar. It may be what I want as my last meal. It was great. The amount is correct, the lamp above my stove casts a really orange glow which is why the mixture looks orange. If you feel like adding more carrot would make it taste better though, by all means give it a try, and let us know how it goes! It’s not going to taste the same, but you could use water. If you’re just worried about picking the wrong wine, try going to a wine shop and asking for help. Pinot Grigio or a Sauvignon Blanc would both be safe bets for this dish. I love your description of this. Makes me want to make some today! I know my local grocery store sells cured smoked pork jowl. Would it be better to use this because they are both jowls, or would the smoke flavor throw things off? Hi Sierra, it won’t be the same, but I’m sure it would still be delicious with smoked pork jowl. Give it a go and let us know what you think. Do you think salt pork would be a good substitute? 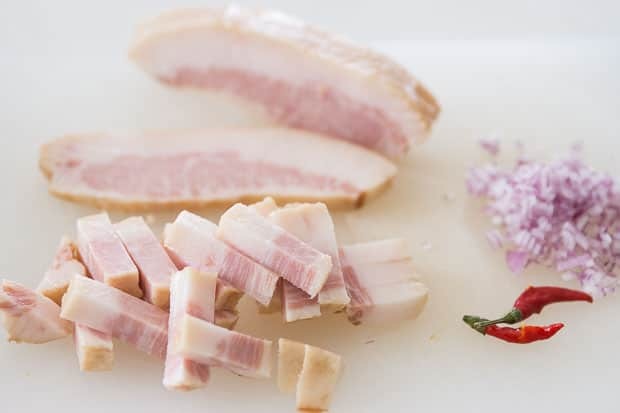 Hi G, salt pork is usually made with belly or fatback, which has a different kind of marbling, it also isn’t usually seasoned with spices or cured the way guanciale is. It will certainly work and it will probably be tasty, but I can’t recommend it as a good substitute for guanciale. I’ve always used a little anchovy in mine….am I thinking of some other sauce? Also, what kind of chili pepper exactly? 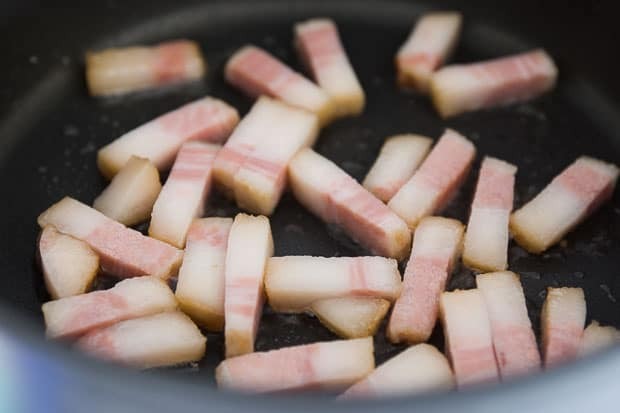 I love pancetta….I have the deli slice up 3 or 4 very thick slices that I use just for cooking (esp. with lentils!!!). Thanks! Any herbs for this recipe? Hi Elsa, you can add whatever herbs you like, but Guanciale is cured with herbs, so Amatriciana typically does not include any additional herbs.